The Association Sénégalaise des Victimes de Mines (ASVM) was founded in 1999 by a group of landmine survivors and has grown to over 400 members, nearly half of all the landmine survivors in Senegal. With official status since 2001, ASVM works on behalf of landmine survivors to assist in the rehabilitation and inclusion of survivors, fight against the threat of landmines, encourage the clearance of landmines from the Casamance region of Senegal and educate the people of the Casamance about the risks posed by landmines. Through partnerships with the International Campaign to Ban Landmines (ICBL), Geneva Call, CICR, UNICEF, Handicap International (HI) and the Centre National d’Actions Antimines au Sénégal (CNAMS, Senegal’s mine action authority), ASVM has been remarkably effective in meeting its mandate, despite financial barriers. Starting with the Mine Ban Treaty and the obligation of states to provide assistance to landmine survivors, ASVM works to identify the capacity of individual survivors and provide them with the means to support themselves. 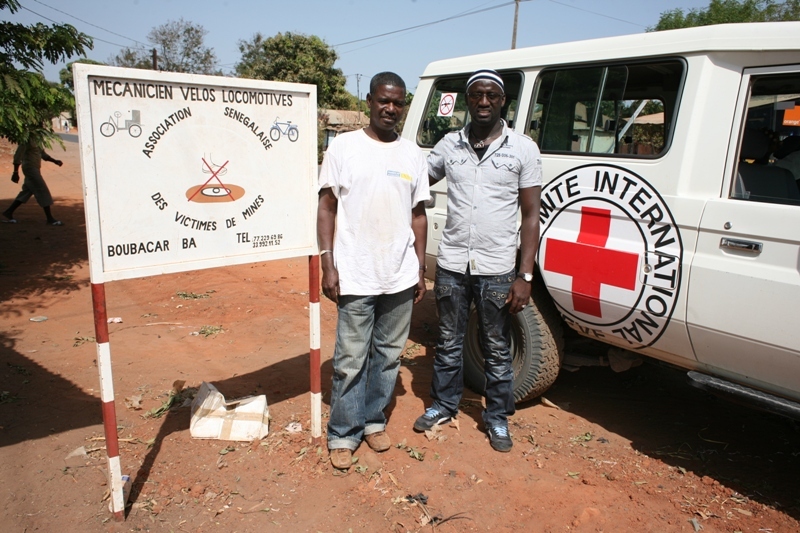 With funding from the International Committee of the Red Cross (ICRC), ASVM worked with a Mr. Ba who lost his leg to a landmine while he was farming near the border with Guinea-Bissau. In interviews, ASVM staff learned that Mr. Ba was a trained bicycle mechanic and so ASVM provided Mr. Ba with the start up capital to open a bicycle repair business which he uses to support himself and his three children. From Seckou Keita, Mr. Ba’s bicycle repair shop. For Martine Niafouna, employment at the Club Med in Cap Skirring beckoned until she too lost a leg to a landmine while collecting firewood. 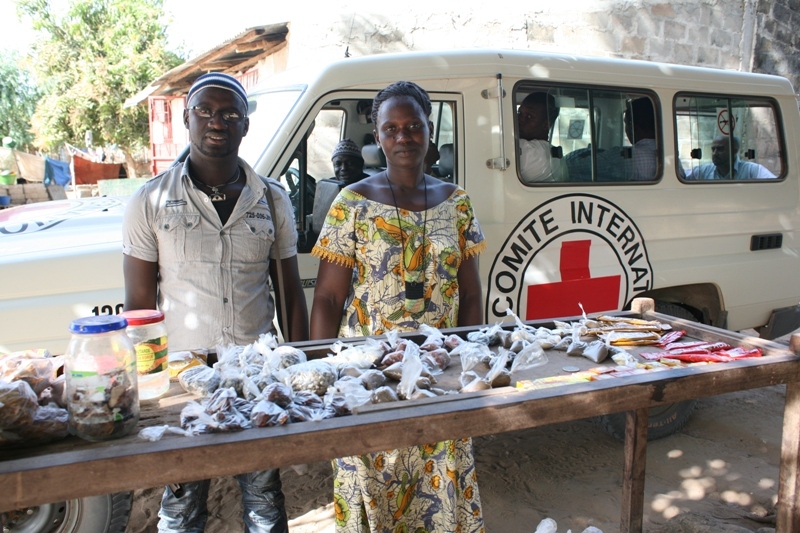 The injury halted her hospitality career, but with ASVM’s support, Martine has established herself as a small businesswoman with a vegetable stall. From Seckou Keita, Martine’s market stall. The founders of ASVM, Mamady Gassana, Sarani Diatta and M. Bacary Diedhiou, are all landmine survivors themselves and by their own lives demonstrate the principle of self-sufficiency. For example, Gassama completed his university studies and now works as a financial and administrative officer for Norwegian People’s Aid and founded a marketing company to promote the products of persons with disability (Scoops of Ziguinchor). For other survivors, ASVM has advocated for making “30 hectares of land south of Casamance’s main city Ziguinchor available to mine victims as well as to local residents, for market gardening, livestock farming and other agricultural work” (IRIN News). As an advocacy organization, ASVM also promotes sports for persons with disabilities as a means of demonstrating the abilities of survivors and to raise awareness about international treaties like the Mine Ban Treaty and the Convention on the Rights of Persons with Disabilities (CRPD). ASVM organized a regional basketball tournament bringing together survivors from the Casamance region, the Gambia and Guinea-Bissau in December 2012. The tournament helped encourage the government of Guinea-Bissau to sign the CRPD. Other sports events hosted by ASVM have sought to build peace among Casamancais communities through football and mine risk education. These activities were part of the Survivor Network Project supported by the ICBL which also provided socio-economic support to survivors and also support by UNICEF (Scoops of Ziguinchor; Scoops of Ziguinchor). In addition to economic assistance, ASVM runs a referral program for survivors to help them find and obtain rehabilitation services from prosthetics to mental health care. ASVM also provides mine risk education programs for persons in the Casamance, using the members’ own experience to highlight the risks to the population. ASVM members go to schools and local communities to conduct mine risk education sessions, sometimes at night to ensure greater participation. 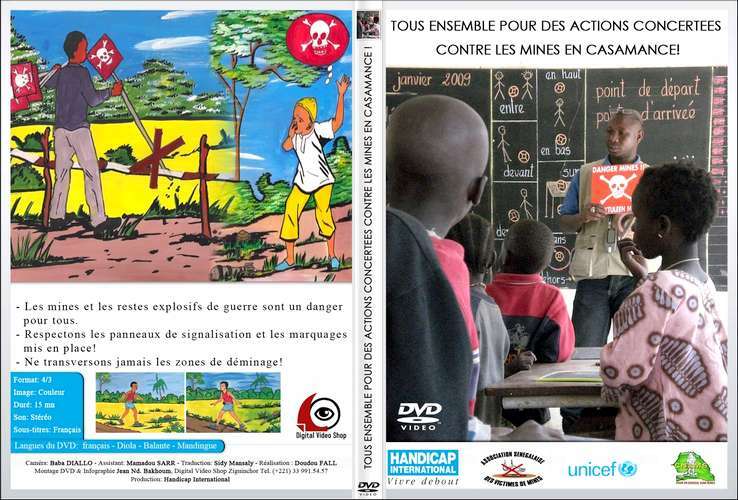 ASVM has also collaborated with Handicap International and UNICEF to produce a DVD on mine risk education. A DVD of mine risk education produced by ASVM, HI and UNICEF. 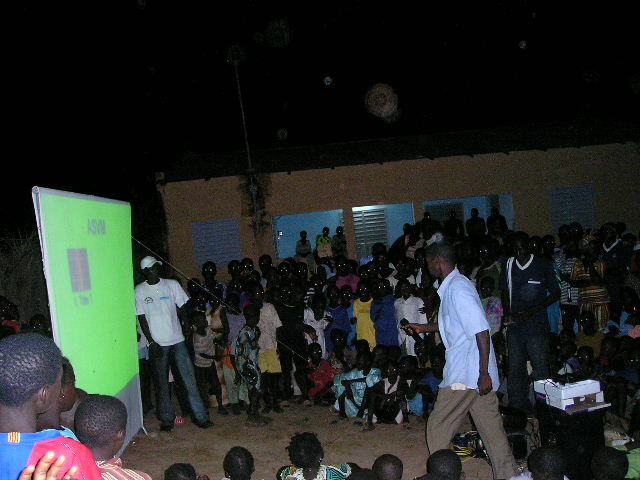 From ASVM, a member delivers mine risk education messages to a community at night. 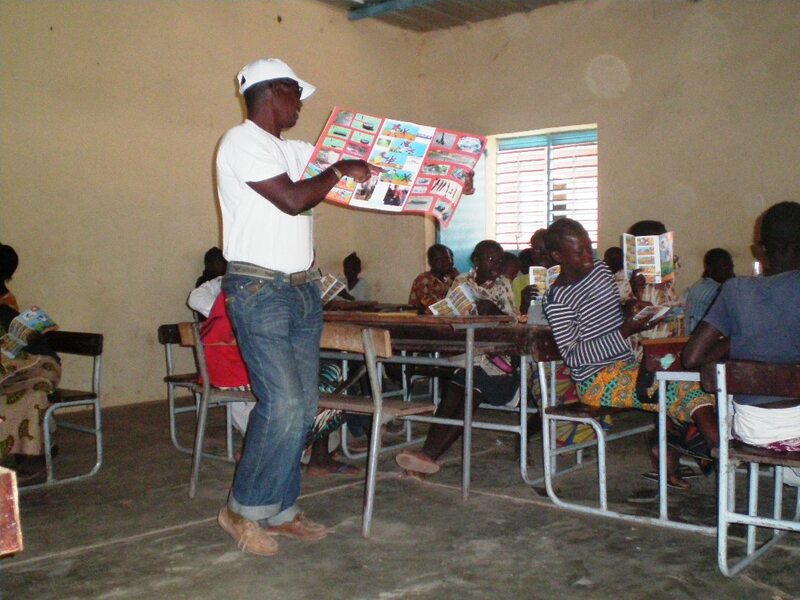 From ASVM, a member provides mine risk education to a classroom. 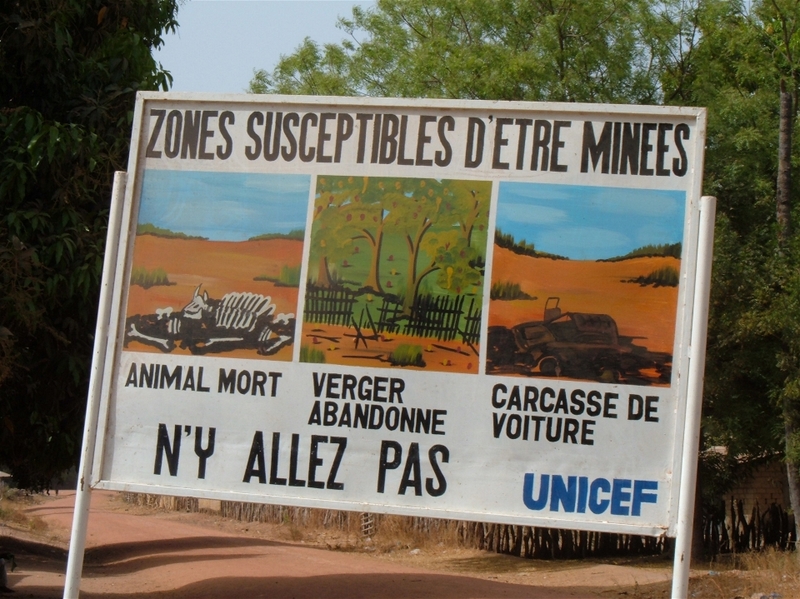 From IRIN News, a landmine warning sign in the Casamance. “We must realize that sometimes the people in power don’t have the level of engagement that we would like to see. In some countries, for example Senegal, it is very easy for them to sign the Treaty but the implementation is more difficult.” Mamady Gassama (Mines Action Canada). The Association Sénégalaise des Victimes de Mines will focus its advocacy efforts on the differential treatment civilian landmine survivors face in Senegal relative to military survivors. Soldiers when they are injured by landmines are provided with preferential medical treatment and a government pension; civilian victims are forced to rely on local health care facilities and receive no compensation. This is discriminatory and as a party to the Mine Ban Treaty and the Convention on the Rights of Persons with Disabilities, Senegal has pledged not to allow such discriminatory policies. ASVM will be publicizing this situation to the international community with the hopes of getting Senegal to change its policies so as to be equitable for civilians and soldiers (M. Gassama, personal communication). In addition to advocacy, ASVM has grand plans to reduce the threat of landmines through mine risk education, to provide education to all in the Casamance by building a school upon land recently cleared of mines and to promote social reintegration and psycho-social support for survivors. These plans require external support from international organizations and the donor community. To help a survivor establish a small business like Mr. Ba’s bicycle repair shop can cost as much as US $2,000, but the return on the investment benefits not just the survivor and his or her family, but the entire community. To fully develop a cleared minefield can cost upwards of US $300,000 depending upon the usage of the land, but such development would vastly improve the economy of the neighboring village and its inhabitants. ASVM has suffered from irregular financing for its programs which threaten their implementation. ASVM’s mine risk education work is especially important as the demining progress in Senegal has been very slow and subject to numerous delays, bureaucratic and security-related. While mines remain in the ground, mine risk education remains the most important means to warn people of the threat. Additional partners and donors are needed for ASVM to be able to meet this need. We often write about the human toll of landmines in this blog, but livestock also are routinely victims of landmine incidents. In November, we find reports from Zimbabwe, Somalia and Tunisia that describe the fate of animals and since these animals are necessary for the economic well-being of their owners, their loss can be devastating. Also in November we see continued reports of new use of mines across northern and Sahelian Africa, but there is also some promise as another couple of countries signal their support of the Mine Ban Treaty. Thirty years after Zimbabwe started the landmine removal process, some in the demining sector are saying that another thirty years will be needed to complete the work. During the liberation war, the government of Rhodesia laid hundreds of thousands of landmines along the borders, especially the border with Mozambique, to prevent its opponents from crossing into the country. According to the HALO Trust, the border minefields are some of the densest in the world with 5,500 landmines per kilometer and the total cost of clearance is around US $100 million. Currently, the International Committee of the Red Cross (ICRC) is providing training and equipment to the Zimbabwean army to increase their ability to clear the mines which have killed or injured more than 3,500 people since 1980. In addition to the human victims, thousands of livestock have been lost to the mines and the extant minefields are poorly marked due to vandals stealing the marker signs (All Africa; All Africa; All Africa). In addition to the ICRC, the HALO Trust has also begun working on Zimbabwe’s landmine issue. HALO has deployed three demining teams to the Zimbabwe-Mozambique border, focusing first on a community in Mashonaland Central whose residents are forced to cross a minefield on a daily basis to reach drinking water, graze livestock and raise crops. As a result, several villagers and livestock from the village of 1,500 persons have been killed or injured by mines. At present an estimate 1.5 million landmines lie along the Zimbabwe-Mozambique border endangering many similar communities (Star Africa). In the semi-autonomous region of Somaliland, the town of Burao, the second-largest city in Somaliland, experienced two separate landmine incidents. Burao’s landmine contamination dates back to the Somali civil war of the early 1990s. In the first incident, a driver for a local electricity company drove over a landmine after installing some equipment. The area surrounding the blast was cordoned off to prevent further accidents (All Africa; Somaliland Sun). In the second incident, a car carrying guests from a wedding at a local hotel drove over a landmine, killing one of the passengers and injuring the driver and two other passengers. The car itself was owned by the local police chief, but he was not in the car at the time of the explosion (Somaliland Informer). In response to these blasts, a demining NGO announced it would start the process of clearing landmines from the neighborhoods and the assistance of the business community and the utility company was sought to assist the deminers (Suna Times). Elsewhere in Somalia, security forces were able to defuse a landmine placed in the livestock market at Beled Hawo town on the Kenya Somalia Border (Radio Bar-kulan). In Galgadud, a truck transporting goods struck a landmine, killing two and possibly injuring other passengers who were riding in the vehicle (Radio Bar-kulan). In response to the explosion, the Danish Demining Group (DDG) and United Nations Mine Action Service (UNMAS) launched a landmine clearance project to prevent further incidents in Galgadud (Radio Bar-kulan). Also in Somalia, Al Shabaab was accused of using a landmine to try and attack an AMISOM convoy south of the capitol, Mogadishu. Fortunately for the persons in the convoy, the timing of the blast was poor and no injuries were reported among the AMISOM troops. Unfortunately for a local herder and his camels, the landmine killed 21 camels who were passing by that spot in the road (RBC Radio). In early November, a truck serving as public transportation and carrying 38 people in the northern Gao region struck a landmine, killing four people and injuring at least eight more (Global Post). In Kidal, also in northern Mali, three French soldiers serving in the peace-making Operation Serval were injured when their truck ran over a mine. Because the French army vehicle was armored, the soldiers were injured, but their lives were not jeopardized by the mine; instead, their injuries were described as “noise trauma” from the blast and the soldiers were expected to return to active duty in a few days (Agence France Presse). In response to these incidents and dozens of others, UNMAS is leading a mine risk education campaign with the support of Handicap International and the United Nations Children’s Fund. Landmine and explosive remnants of war (ERW) clearance is also ongoing with almost 7,000 pieces of ordnance cleared so far. UNMAS is currently training Malian soldiers on clearance techniques and Handicap International is providing rehabilitation services for survivors (All Africa). Despite these efforts, the ability of humanitarian organizations to reach populations in need is continually hampered by the presence of landmines and ERW. According to Doctors without Borders, “Our biggest worry is homemade bombs [improvised landmines] on the road” (All Africa). In Rome, the 38th International Conference of Support for the Sahrawi People launched and international campaign against the landmine-ridden berm put up by the Moroccan government to isolate the Polisario Front. With more than 7 million mines, the berm presents a constant threat to the Sahrawi people, with hundreds of people killed or injured by the mines as they try to graze livestock near the berm. The campaign was launched a week before a meeting of US President Barack Obama and Morocco’s King Muhammed VI (All Africa). At a seminar for regional coordination for mine action in Angola, attended by deputy governors of the nation’s provinces, the director of the National Inter-Sectoral Demining and Humanitarian Assistance Commission (CNIDAH) declared that landmine clearance enables economic and infrastructural development while also calling for registration of persons with disability injured by landmines in order to better provide services for the population (All Africa; All Africa). At a subsequent meeting, the National Demining Institute announced new policies to provide better protection and insurance to the people responsible for clearing landmines while also approving the use of mine detection dogs (All Africa). In addition to official meetings and policies, mine action continued apace with hand grenades, landmines and other explosives destroyed in Luanda (All Africa). The HALO Trust completed clearance within Catengue locality in the southern province of Benguela and acknowledged that additional landmine clearance is required in the areas surrounding Catengue (All Africa ). A sense of the scale of work completed and yet to be completed was provided during a preview of Angola’s presentation to the 13th Meeting of States Parties to the Mine Ban Treaty which was held in Geneva in December. According to the CNIDAH preview, landmine survey has been completed in 12 of Angola’s 18 provinces, but the CNIDAH representatives expressed confidence in their ability to complete landmine clearance by the deadline of January 1, 2018 (Prensa Latina). However, until clearance is completed, the government recognizes the continuing threat and has purchased 45 Casspir landmine-resistant vehicles from South Africa’s Denel Land Systems (Defence Web). The Jebel Chaambi area continues to be plagued with landmines from the Islamist group that uses the mountain as a base. In November, three separate blasts occurred, injuring one woman, killing several sheep and possibly killing a donkey. Earlier in the year, the mountain was the focus of Tunisian army activities to try and root out the Islamists, but November’s explosions were the first since June (Tunisia Live; Tunisia Live). The United Nations Security Council extended the mandate of the Interim Security Force for Abyei (UNISFA) until the end of May 2014. The resolution reaffirmed the Security Council’s concern “with the residual threat of landmines and explosive remnants of war in the Abyei Area, which hinders the safe return of displaced persons to their homes and safe migration” and demanded that the governments of Sudan and South Sudan allow UNMAS to operate freely in the area to mark and clear landmines (All Africa). Egypt’s landmine contamination is severe. More than 20 million mines according to some estimates. Along the eastern coast of the Suez Canal, some 5.5 million mines remain from the October 1973 war with Israel, covering a thousand square kilometers and impeding the development of the region. In the northwest of the country, along the border with Libya, millions more mines remain from World War II. Along the Suez Canal, landmine clearance is being conducted with domestic funding, but in the northwest, support for landmine clearance is coming from the government of Italy and the European Union (EU). In addition to landmine clearance, the joint EU-Italy project will provide assistance to landmine survivors and the supporters of the Suez project have called upon the government to compensate landmine survivors with pensions similar to “martyrs of war” (Egypt Independent; European Neighbourhood and Partnership Instrument). In addition to development programs, landmines have also become a feature of the recent strife between the Egyptian government and Islamist factions supportive of the ousted Mohamed Morsi and the Muslim Brotherhood. In the Sinai, near the Suez Canal, a weapons cache consisting of landmines, mortars and ammunition was confiscated by security personnel (Masrawy). The United States Department of State updated its travel warning for any US citizens traveling to Eritrea. Besides recommending against any travel to the country, the State Department also noted the continuing presence of landmines along “well-traveled roads in and near the Gash Barka region of western Eritrea” noting the “subsequent investigations indicated that several mines were recently laid” (Asmarino). In Benghazi’s shopping district, an anti-tank mine was found in a bag and defused by bomb disposal experts. Had the mine been detonated, it would have caused significant damage (Libya Herald). Also, for the first time and as a result of great advocacy work by a number of groups, Libya voted in favor of the United Nations resolution on the “Implementation of the Convention on the Prohibition of the Use, Stockpiling, Production and Transfer of Anti-Personnel Mines and on Their Destruction.” Libya had in past years abstained from the vote, as do all states who are not supportive of the Mine Ban Treaty; no one active votes against the Treaty and thus, for landmines. Morocco, despite its liberal use of anti-personnel landmines in the Western Sahara berm discussed above, also voted in favor citing the humanitarian goals of the Treaty. Countries that abstained from the vote typically claim that anti-personnel landmines still retain some military utility as defensive weapons whilst acknowledging the humanitarian impact of their use (Reaching Critical Will). Last week saw the publication of the annual Landmine Monitor report which reported a dramatic decline in the number of landmine victims in 2012 (3,628 compared to 4,474 in 2011) and an equally impressive increase in the amount of funding for mine action (US $681 million compared to US $662 million in 2011). On the African continent, the number of casualties in 2012 decreased by over a third (from 1,054 in 2011 to 672 in 2012) and three African states, Senegal, Mali and Zimbabwe, received international support for mine action in 2012 for the first time in several years. However, the picture is not quite as rosy as it appears at first glance. Landmines remain a constant threat on the continent. While the total number of landmine casualties in Africa decreased, the number of countries with landmine casualties increased from 20 in 2011 to 22 in 2012. 12 countries (Algeria, Cote d’Ivoire, Djibouti, Egypt, Eritrea, Guinea-Bissau, Mali, Mauritania, Niger, Somaliland, Western Sahara and Zimbabwe) saw an increase in the number of casualties in 2012. Of those, four countries (Cote d’Ivoire, Djibouti, Mauritania and Niger) had zero casualties in 2011. Casualties in Mali increased by 900% over 2011 and the new funding was due to new landmine use by Islamist rebels in the northern areas of the country who briefly seized control. The increased casualties in Niger, Mauritania and Algeria are likely related to spillover from Islamists attacks in Mali and the proliferation of landmines from the collapse of the Gaddhafi regime in Libya in 2011. At this week’s Meeting of States Parties to the Mine Ban Treaty in Geneva, no African states declared themselves mine-free and four, Chad, Mozambique, Niger and Sudan received extensions on their landmine clearance obligations. The threat of landmines will not go away anytime soon. Yes, progress is being made in mine action, but it is slow and until the work of landmine clearance is complete, there will continue to be new victims. In addition, new conflicts, such as in Mali, may continue to be accompanied by new landmine use. Mine action, unfortunately, still matters in 2013 and for the foreseeable future.